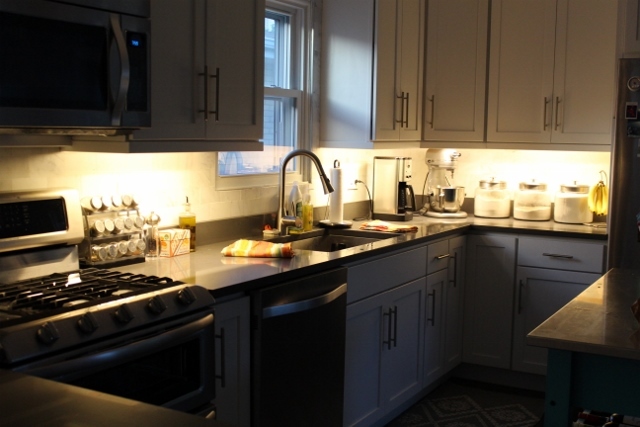 I always thought under cabinet lights would be nice to have, but it wasn’t a “must” for me when we were designing our kitchen. My house growing up didn’t have under cabinet lights, and neither did our apartment. I mean, how dark could the counter really be? Well, usually, not too dark at all. But, there was one corner where the mixer lived that did get pretty dark. I think the light just didn’t have a great path to that one corner. It made late night cake baking (which oddly happens more than you would think) a bit of a challenge. 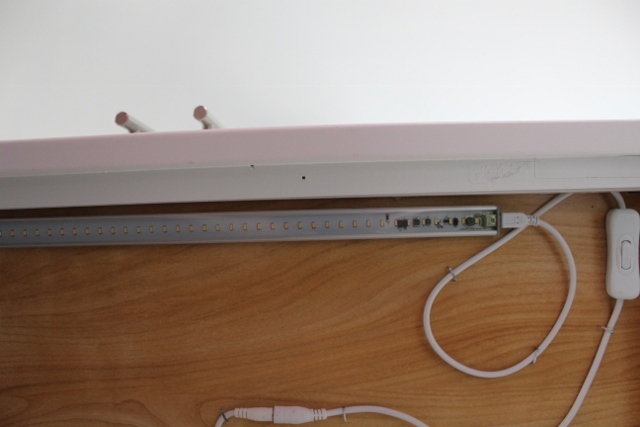 Dan picked a plug in system that all linked together with mini USB connectors. We also had some outlets behind the cabinets already, which certainly made the job easier, but involved a lot of drilling. Plus, we had always planned for eventually adding the lights, so when we ordered the cabinets, we also ordered light rail. The light rail basically hides the lights from being seen, as they fall reach lower down than the lights. The rail had been sitting in our garage since the cabinets were delivered, just waiting until we finally got to this lighting project. I’m glad I wasn’t home when Dan drilled into our new, all wood, expensive cabinets to connect the power cord to the lighting. I would have had a panic attack! What if the hole wasn’t drilled correctly? We couldn’t ruin our new kitchen already. Luckily, Dan worked like an old pro getting the wiring figured out and attaching the lights and wire under the cabinet with some staples. He put in two light switches – each on the front rightmost side of two of the cabinets, which makes the switches really easy to reach. The only downside was the light rail makes the mixer fit pretty snuggly in its little corner there. I can’t just pull the mixer out to use it anymore; instead, I have to sort of tilt it to get it out from underneath the cabinets. We talked about installing some kind of mixer lift, but I’m not sold on that solution yet. I would have to give up a cabinet, and that may not be a sacrifice I’m willing to make just yet. Even with the unforeseen mixer difficulties, I’m still extremely happy with our roughly $150 (not including light rail) under cabinet light upgrade.